FAQ: Window and glass smart film with remote control - do you have a 12v DC electric remote control stick-on window film kit? Please note that we have a new evaluation kit with electrodes installed, and a new website for the PDLC smart film. This page is here for legacy purposes only. Please note that the quality of these wifi and electronic window films varies greatly; we advise that you should always buy from a trusted source or obtain samples to test before committing to a large purchase. We have spent about 3 years thoroughly researching production facilities and testing production output, before we released our own RT smart film brand. Many manufactured types have much narrower transparancy ranges, higher voltage requirements and a high failure rate. We are now offering this material for sale, pre-cut to size with electrodes installed. 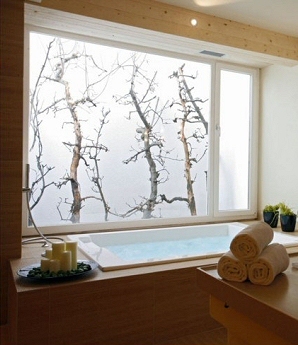 Please see our ElectricWindowGlassFilm.com website for pricing and detailed information. It operates on 12v DC (great for cars, boats, motorhomes, travel trailers, etc. ), and we also have power supplies that plug into a regular AC outlet. We have gone to great lengths to avoid these lower quality suppliers, and to keep the voltage input down to a safe 12v DC level, which also makes it compatible with our 12v DC roller shade and window opener motors (and all the wifi and microprocessor control systems we develop). The sample contained in our evaluation kit is cut from the very same high quality product we ship for general installation. We have prepared an evaluation kit for those of you interested in learning how to work with this very useful electro-chromic material; please see our online store to purchase our smart film evaluation kit. Simply cut it to whatever shape you need, apply it to your glass window or partition, and connect the wires - presto, you can now adjust the opacity of the window by electronic remote control. This material consumes 5 watts per square meter when switched on in full transparent mode; the blocked opaque mode uses no power. 2. Razor blade cutting tool for separating smart film layers. Please Note: Please be careful not to cut yourself; do this while sitting at a table, not on your knee. Please do not scrape the polymer material off, you will damage the conductivity (use rubbing alcohol or nail polish remover, as in step 8). 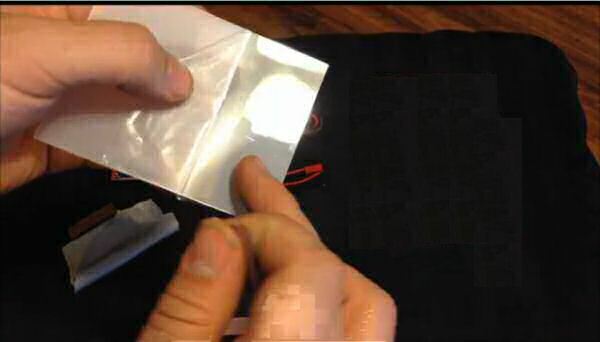 Please do not drill or puncture the material, it will cause problems. 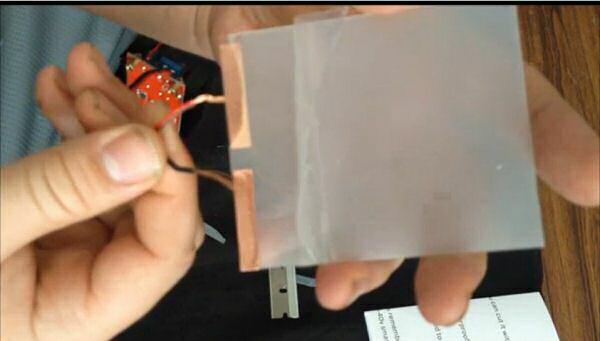 It is the liquid polymer layer that changes its transparency state when a voltage is applied to each of the external semi-rigid plastic 'sandwich' layers. 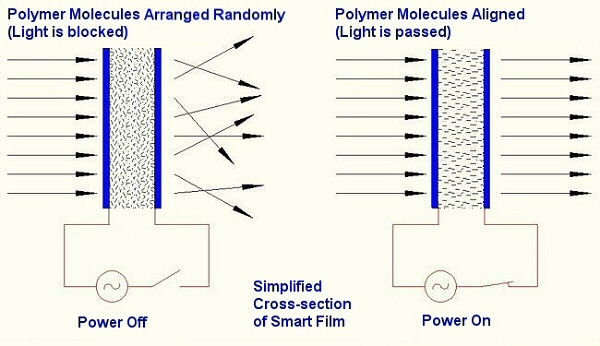 In its unpowered state, the long polymer molecules are randomized, resulting in an partially opaque film that you cannot see through. 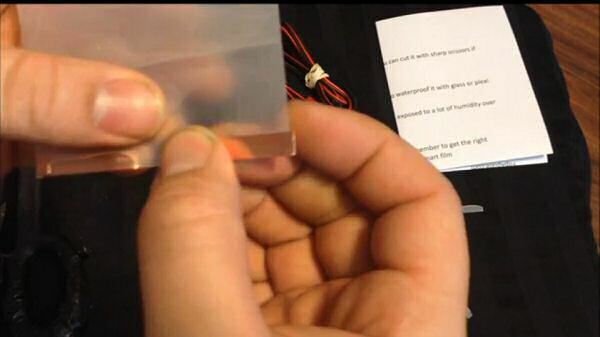 When enough voltage is applied, the molecules line up and the film becomes instantly transparent. 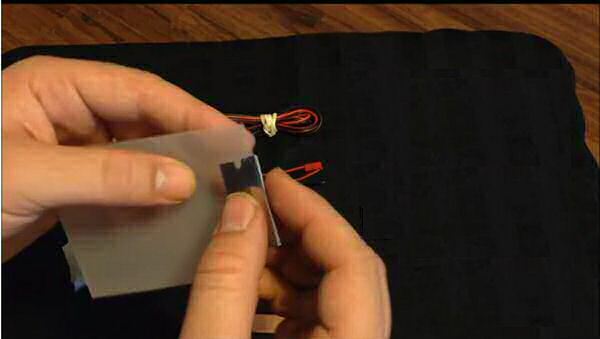 The copper strip electrodes are attached to the inside surface of each of the plastic outer layers of the 'sandwich'. 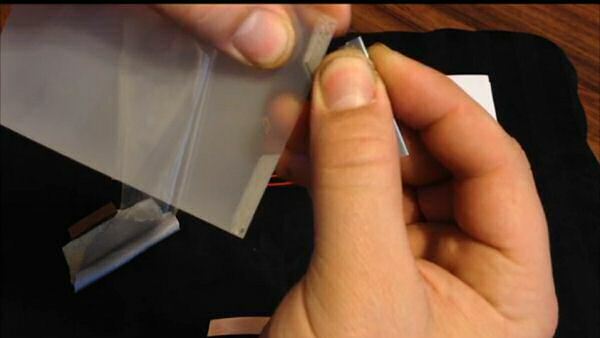 It is important that the copper strips touch only the plastic piece they are attached to, and NOT the other plastic side or the sandwiched polymer material itself. You'll see in the following steps how this is accomplished. 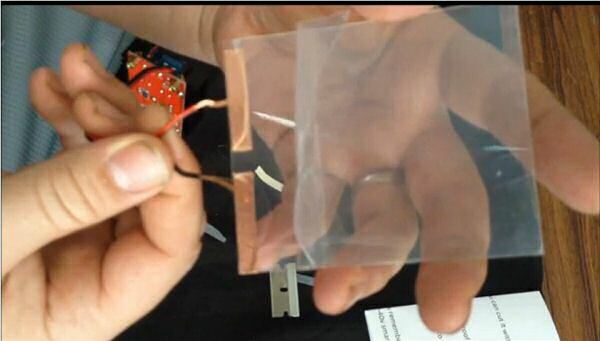 With this latest generation of material, the transparency effect starts at around 20 volts and reaches a maximum state of transparency around 40 volts. Although our 12v kit uses a fixed inverter output of 40v (basic on/off effect), you can vary the output voltage of the inverter by screw adjustment to observe partial transparency. Damage to the film occurs at voltages above 60 volts, although our DC output will not go that high. Neverthless, please be careful if you try adjusting it (use a voltmeter). If you don't have a voltmeter, our kit can be ordered with a very capable auto-off digital multimeter. 3. Peel back protective cellophane layers on both sides. It does not need to be removed, you just need to peel back enough to expose the edge of the material, in preparation for attaching the copper terminal strips. 5. The next step is to use the razor blade to separate the two inner layers of semi-rigid layers at an edge. You just insert the blade between the layers and draw it along; the razor blade is actually touching the polymer material as you do this. You'll be doing this from both outer edges, and you'll need to leave a short 'isolation' zone between the two prepared sections, as shown in the picture. The purpose of the isolation strip is to prevent a short circuit from occurring between the two copper electrodes that provide the power required to switch the smart film on and off. 6. After you have scored it, opening and spreading the outer stiff layers a little, the next step is to actually remove the outer plastic layer strip, exposing the polymer on top of the plastic layer on the other side. 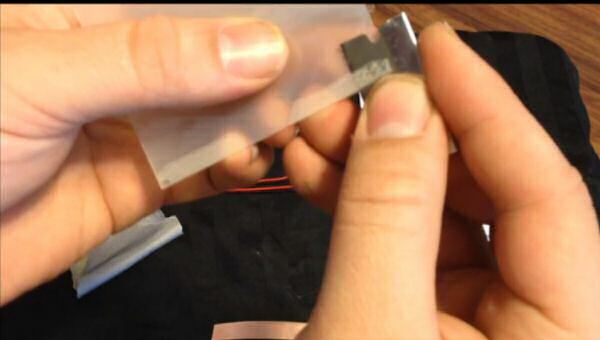 The polymer residue will be removed in the step, and the copper electrode will actually be attached to the inner edge of the plastic on the other side that has been exposed. After removing the plastic strip section covering the first electrode location, flip it over and do the same for the other side. 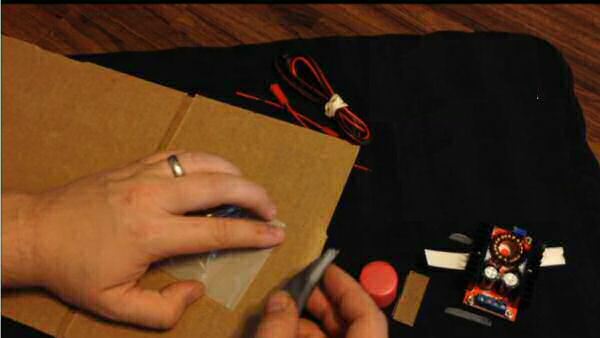 Each of the 2 copper strip electrodes must be on the inside of the 2 outer plastic 'sandwich' halves. 7. Here we show the first strip removed, exposing the polymer residue on the inside surface of the stiff plastic layer at the back. Both sides end up looking like this, and you'll need to develop a little bit of skill for this part, it is the most difficult part of the procedure. 8. Once both strips have been removed, clean the polymer residue with a cloth soaked with isopropyl rubbing alcohol or nail polish remover. 9. 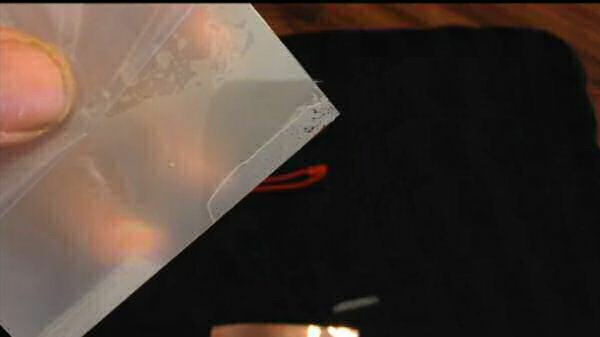 This picture shows the polymer residue removed, exposing clear plastic layers. Note the isolation strip at the center. 10. 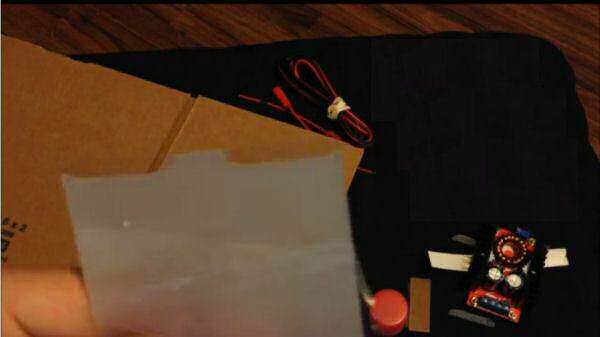 Cut the copper electrode strips to size and stick them on the exposed plastic pieces, one on each side. You can wrap the copper around the outside edge. Do not let it touch the top layer, above the point where it is cut away. 11. Now that the electrode connections are done, attention can be turned to the power. The first step would be to connect the output of the 12v DC power supply that is plugged into the AC mains outlet. Please don't plug it in to the AC outlet until you have connected and checked your connections all the way through to the smart film. 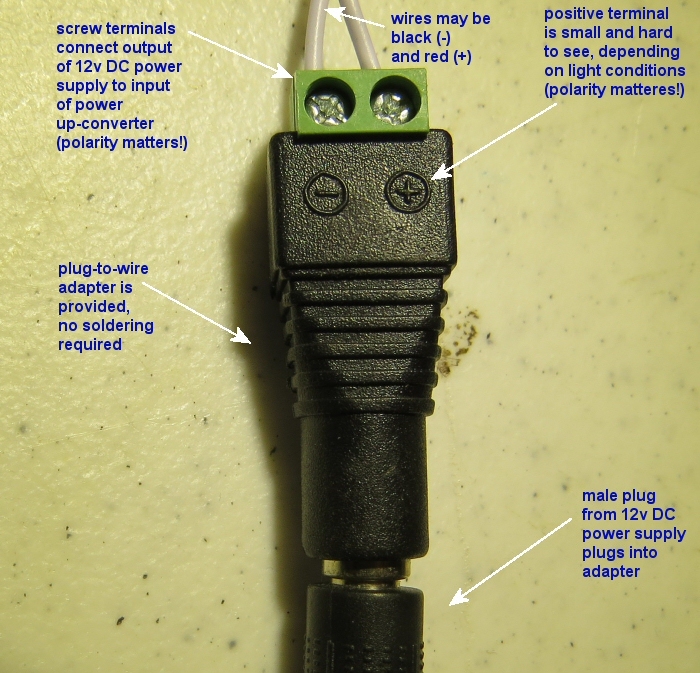 The 12v DC power supply output is connected to the voltage converter/booster via the screw terminals on the provided adapter, shown above. 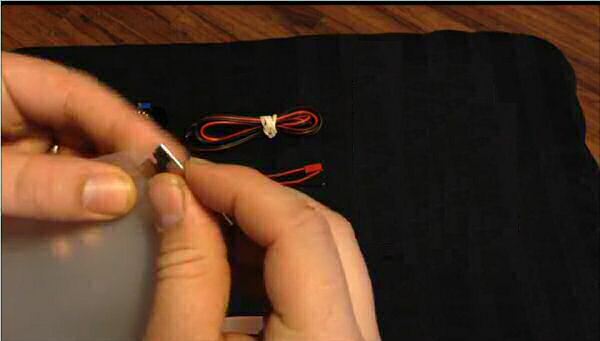 This adapter eliminates the need to cut and solder anything. PLEASE OBSERVE POLARITY! 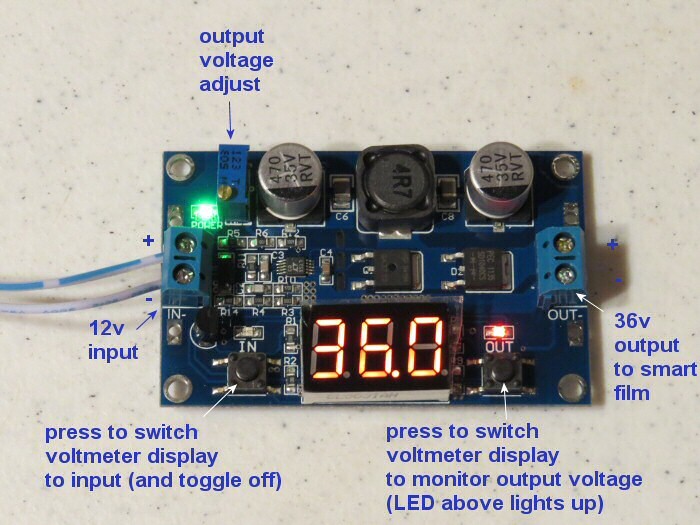 The converter boosts the voltage from 12v DC to 36v DC. It is capable of outputting more than 36v DC, but anything in excess of that will not increase transparency. Please do not substitute a power supply that can put out more than 60v as that will damage the film. Please Note: You will not normally get a shock if you touch the inverter output, but you could get a minor non-lethal shock if you were touching a ground point elsewhere, like a cold water tap or the metal housing of a piece of electronic equipment. It would not be a good idea to stand with bare feet on a wet concrete floor in the basement while working with the power supply. Do not connect more than 60v AC or DC to the material, it will be damaged. 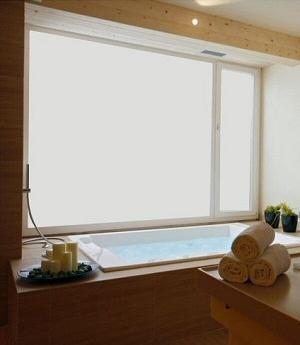 If using it outside, be sure to seal and cover it with plexiglass, polycarbonate or regular glass. Long term exposure to high humidity can damage the material. After you have plugged the power supply plug into the adapter and attached some wire to the screw terminals, you would now connect the wires from that 12v power supply output adapter to the inverter input, as shown above, observing polarity. Note that one side of the green screw adapter for the power supply output has a terminal marked with a + sign. Be sure that you connect that wire (usually red) to the screw terminal INPUT of the inverter marked +. Same goes for the negative side (-). The output terminals of the inverter are also shown in the picture above; these wires connect directly to the smart film, but you can also wire the switch in series with one side of the output wiring so that you can turn the transparency on and off. You can also adjust the voltage output by turning the screw, as shown in the picture. If you connect a voltmeter across the terminals, you can watch the voltage change as you adjust the output, and/or you can also use the built-in voltmeter. 12. Now you are ready to activate smart film. In this picture we are simple touching the wires to the film electrodes, but you can also use the alligator clips (provided). Also, if you wire in the provide toggle switch to one of the wires (usually positive side), you can switch the transparency on and off. The technology was actually developed in the 1980's, but this newer generation has brought it to the truly practical stage. We think this is one of the most exciting window treatment technologies to emerge in a long time; please stay tuned to this page for product release information, coming soon. At the current state of development, it’s not entirely see-through when it’s in the transparent mode (7% haze), and it doesn't block 100% of the light in opaque mode, but it is still a very useful material that will only improve with time. It consumes 5 watts per square metre when switched on to full transparent mode (blocked opaque mode uses no power). 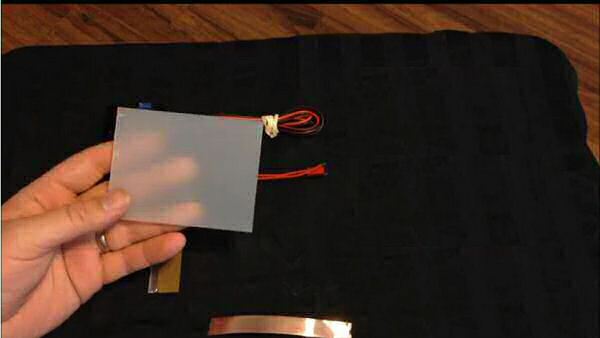 Voltage can be adjusted for varying degrees of transparency; it reaches maximum transparency at around 40v AC or DC. Please see our online store for our smart film evaluation kit. We sincerely hope you enjoy using these advanced technology systems and motors; if you have any questions, please feel free to contact us at any time!